Welcome to the latest instalment in Crime Watch's ongoing series of quickfire author interviews; 9mm - 9 MurderMystery questions put to a variety of New Zealand and international crime, thriller, and mystery authors. We’ve had some great authors featured thusfar, and I’m looking forward to seeing how the series continues to grow in the coming months. If you have suggestions of authors you’d like to see interviewed, please let me know, and I’ll do what I can. 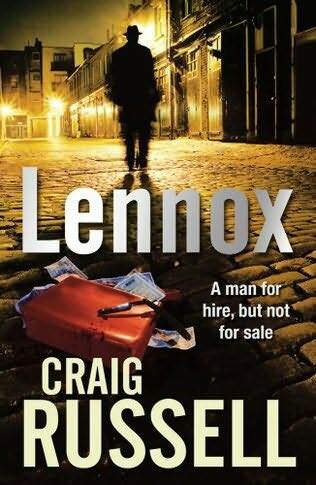 For the 13th in this regular series of quickfire author interviews, I put the 9mm questions to Scottish crime writer Craig Russell, the author of the best-selling and critically-acclaimed Jan Fabel thrillers set in Hamburg, Germany and the Lennox thrillers set in 1950s Glasgow. His evocation of Hamburg in the Fabel series is so good that early in his career some media thought he was a German writing under a British name, rather than a Scotsman writing stories set in Germany. In 2007 Russell was awarded the highly prestigious Polizeistern (Police Star) by the Polizei Hamburg, the only non-German ever to receive this award. He has also won the CWA Dagger in the Library, and been shortlisted for the CWA Duncan Lawrie Gold Dagger. I first came across Russell when I picked up a copy of BROTHER GRIMM from the airport bookshop when I was headed from Auckland to LA in 2007. I read the book at summer camp (I was a counselor), and really enjoyed the mix of modern crime entwined with myth and history. Last year I was fortunate enough to interview Russell for a feature article in The Weekend Herald, looking at his Hamburg-set Jan Fabel thrillers, and his then-recent foray 'back home' to Scotland with the start of his 1950s Glasgow-set Lennox series (you can read my EuroCrime review of LENNOX here). I found him to be very intelligent, humble, and interesting to interview. So it is with great pleasure that I share this new, recently-completed 9mm interview with Russell, with all of you here. In print – and film, for that matter - Philip Marlowe. Undisputed noir hero number one. I think Marlowe defined for me what a noir hero should be: someone who uses a veneer of tough-guy cynicism to disguise a basic and unshakeable morality and sense of right. When I was a kid growing up in the sixties, I was hooked on American TV series like The Fugitive, with David Janssen as Richard Kimble. I think I’ve always identified with outsider protagonists. I can’t remember the title, but it was about cars in a garage who came to life at night. Their headlights became eyes, their grilles smiles, etc.. It was in a sort of Thomas the Tank Engine style but was a bit darker. It was mainly in pictures with a few words on each page and I remember reading it over and over at seven o’clock, my regular bedtime. Which is quite sad, because I was 23 at the time. No, seriously, it was just before I was old enough to go to school (I could read before I went to school which, of course, led to all kinds of problems). I really wish I could remember what that book was called: it left me with a cosy feeling about the dark and night, which may explain a lot. I think the next book to really capture my imagination was Kidnapped by R.L. Stevenson. I worked as a freelance writer for 12 years before becoming a novelist. Mainly ‘corporate communications’ and marketing. I wrote scripts for TV and radio commercials, speeches for CEOs, direct mail, all of that kind of stuff. I came up with campaign ideas for political parties, universities, even the government. I also wrote short stories, mainly literary, pretentious stuff that I would blush at now. I read and write (I’d do it for a hobby if I didn’t have to do it for a profession). I also paint and cook, but not simultaneously. I go for long walks with my dog. I embarrass my children to a world-class standard. I have to say, that’s a bit of a stupid question, I mean it’s obvious, isn’t it? And if Pitt wasn’t available, then Depp would do if they gave him really good lighting. According to my kids, I look like a Bond villain but, to quote them: “not one of the cool new ones, one of the naff seventies ones’. I kicked that into touch by pretending I was flattered and trying to find safari-suit suppliers on the internet. Gosh, that’s a tough one. I’d say it’s between Brother Grimm and Lennox. But I’m really pleased with The Carnival Master and The Valkyrie Song. I’d say Lennox was the most fun to write. There was no single moment, as such. There was a multi-publisher auction, both for the English-language and German editions of the Blood Eagle. Both went on during the Frankfurt Book Fair and I had a new mobile phone, for which only Carole, my agent had the number. So every time it rang, I knew there was another bid on the table! When the deals were finalized, I relaxed with some champagne. Very relaxed. I think my biggest reaction to seeing the book on display was getting off a plane and seeing a big display in a German airport bookshop. There was a photograph of me in the window. Weird. The most annoying thing was when I was doing a reading in Germany. I was doing the reading from my book in German which, as you can imagine, demanded a lot of concentration. A journalist and a photographer in the front row, immediately in front of me, carried on a full conversation in whispers, laughing at each other’s witticisms. It was very distracting and I was getting angrier and angrier. Eventually the journalist yawned loudly and I stopped the reading and asked him if I was boring him and if he wanted me to wait until he had finished his conversation. He apologized profusely and I continued, but it spoiled the event for the rest of the audience. Oh, and I was accosted by a religious cult before an event. But there again, that’s the sort of thing that tends to happen to me on a weekly basis in normal life. Thank you Craig Russell. We appreciate you taking the time to talk with Crime Watch. So what do you think of Russell's answers? Have you read any of his Jan Fabel series? Or LENNOX? If so, what did you think? Do you like Scottish crime? German crime? Thrillers that mix in myth or history? Thoughts and comments welcome. Craig - Thanks, as always, for this interview. I really am enjoying learning about authors : ). I must confess I'm not familiar with Craig Russell's work, but I've heard good things about it, and now I'm interested in giving it a go. Great interview. I think I may have to work on embarrassing my children to a world class standard too. Okay, been on his site and read some extracts. I'm going to start with the Fabel series. Great interview.